It’s a busy day on the blog, but don’t think I’ve forgotten about the fabulous Alley Cat Daydream mash-a-long! Today we’re sewing the MMUp and this one couldn’t be more simple. Just as there were no alterations to make to the individual pattern pieces, this month there isn’t anything different to do with the sewing. 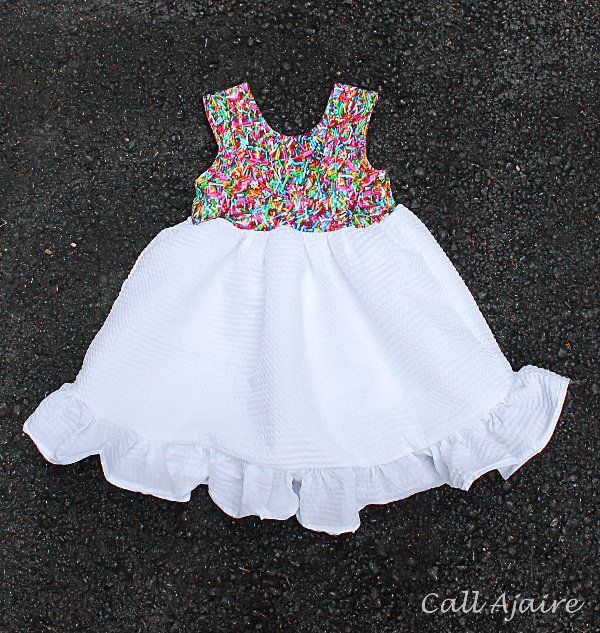 Simply follow the instructions for making the bodice of the Alley Cat Romper (*affiliate link), and then jump over to how to sew the skirt portion of the Daydream Ruffle Dress. Instead of gathering the skirt to fit the Daydream bodice, gather it to fit your Alley Cat bodice and voila! Instant MashUp! right?!?!? I was just looking at that! goodness…. Oh girl I'm so not prepared. It usually doesn't hit here in MD until late October and last year it was even into November before it turned cold. This year of course all of September has had a chill. I love it, but I wasn't ready for preschool leggings and cardis at all. I seriously whipped up a pair of leggings before school the other day cause she wanted to wear a dress that her legs would have frozen in…. i'm ridiculous haha. Super cute Ajaire! It looks so cozy and I just love that fabric!